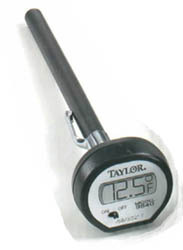 Tin Cutters, heart, round, oval, fluted, hexagon, canape, cutter, shapes, Probe Thermometers, Digital Thermometer, Oven Thermometer, food molds, food cutters, Taylor Thermometers on sale! With proper care these will last many years. 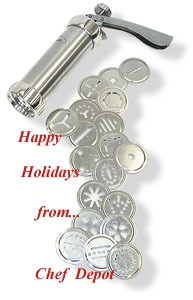 We have used our stainless steel cookie cutters to make thousands of cookies! They keep on going for years without any problems! We also stock a complete line of Cake Molds, Rosette Makers and thousands of other food molds, food cutters - please email us! These are heart cutter sets. They are very high quality and each set comes in a metal case. We like to use them for cookies, garnishing buffets and puff pastry dough. The square cutter set is aprox. 5 in., 4 in., 3 in., 2 in., 1 in. and 3/4 in. squares in a tin. Made in Italy. We have several thousand other cookie cutters, shapes, numbers, letters and more. Please call us! Click here for High Heat Red Pot Holders! We have several thousand other cookie cutters, shapes, numbers, letters and more. Please call us! Click here - best Knife Sharpeners! This is the highest quality Cookie Press made today. All metal, aluminum cookie press made in Italy. Includes 20 useful disks. This set makes a perfect gift or use it to make perfect holiday cookies! These are round fluted cutter sets. They are very high quality and each set comes in a metal case. We like to use them for cookies, garnishing buffets and puff pastry dough. Click here - Chef Quality Pots & Pans. This is our new 7 leaf cutter set. They are very high quality. We like to use them for cookies, garnishing buffets and puff pastry dough. Great for fruits, vegetables, aspic and decorating cakes and cookies! Click here - Chef Quality Pots & Pans! 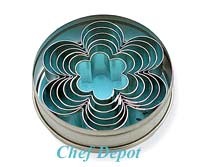 This is a daisy cookie cutter sets. Set of 5 pieces. We like to use them for cookies, garnishing buffets and puff pastry dough. Click here - Chef Quality US chop blocks! This is a star cookie cutter sets. Set of 5 cutters. We like to use them for cookies, garnishing buffets and puff pastry dough. Click here - Chef Quality Pro Knives. This is our alphabet cutter sets. Each one is aprox. 1 in. long. They are very high quality. We like to use them for cookies, garnishing buffets and puff pastry dough. Great for fruits, vegetables, aspic and decorating cakes and cookies! Click here - Chef Chop Blocks! 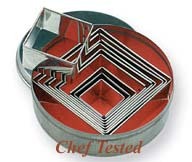 This is our square pastry & cookie cutter sets. They are very high quality and this is now a set of 5. We like to use them for cookies, garnishing buffets and puff pastry dough. Click the green arrow on the right for more Cutters!